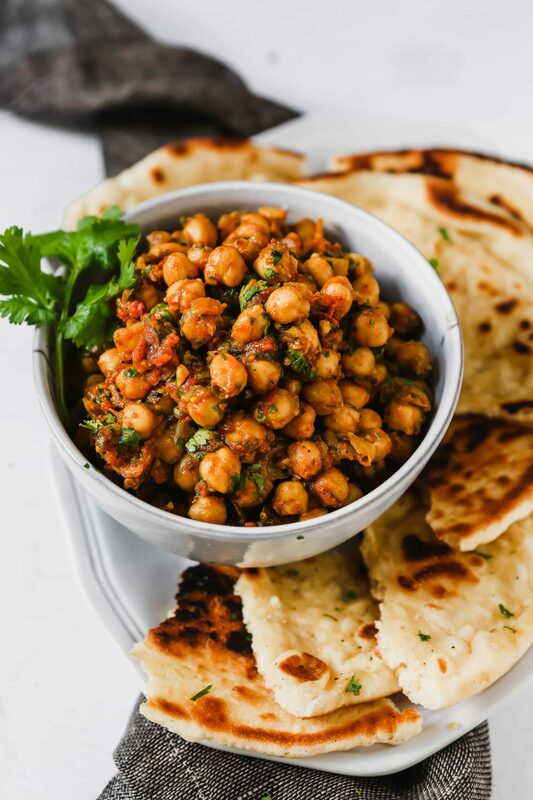 No need to meal prep because this version of the classic chickpea dish from India and Pakistan is ready, start to finish, in just 40 minutes. Yes! Just 40 minutes is all it takes for you to have a satisfying, taste-bud-pleasing, dinner on the table. So, what is Chana Masala? 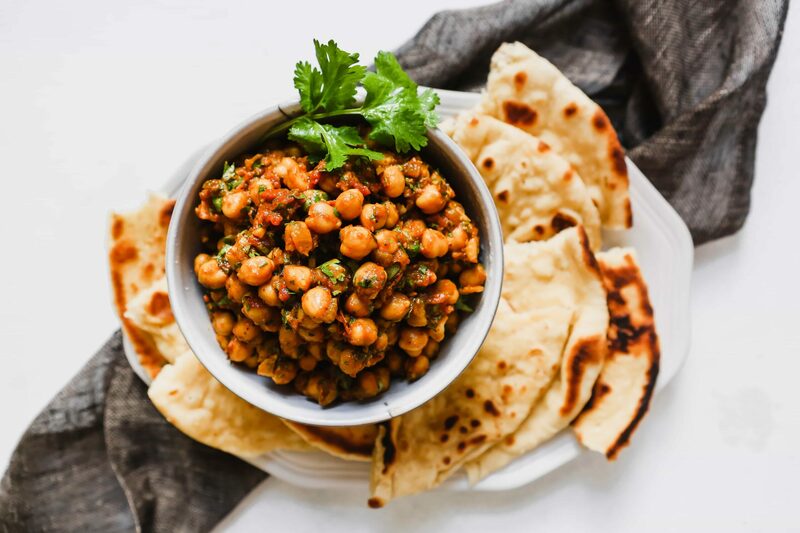 Chana Masala is one of those dishes that’s unassuming at first, but blows you away with just one bite. This chickpea-based dish is best described as a stew-like curry. 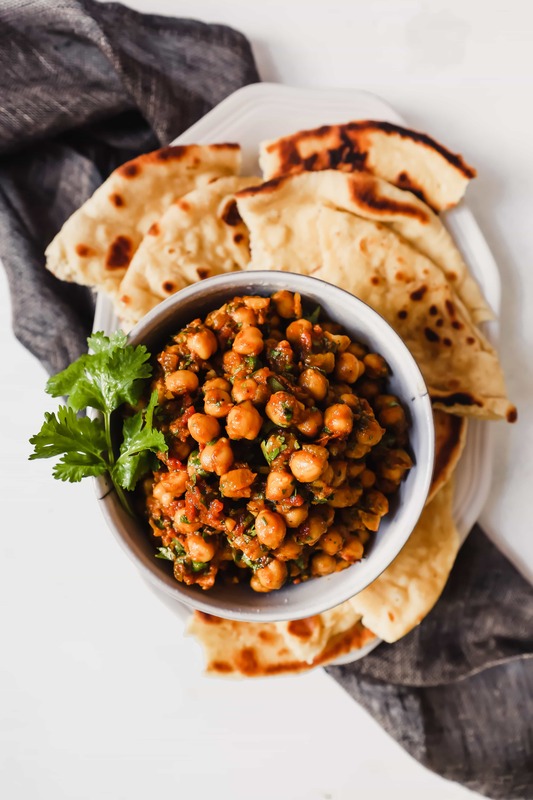 Traditionally Chana Masala is made by cooking a paste of onions, chiles, garlic, and ginger in oil before adding a mix of spices which often includes coriander, turmeric, and cardamom (to name a few). Diced tomatoes, chickpeas, and broth are added to the pan then simmered until the sauce has thickened and the chickpeas have softened. Cilantro and a bit of lemon juice are often added for a fresh finish. 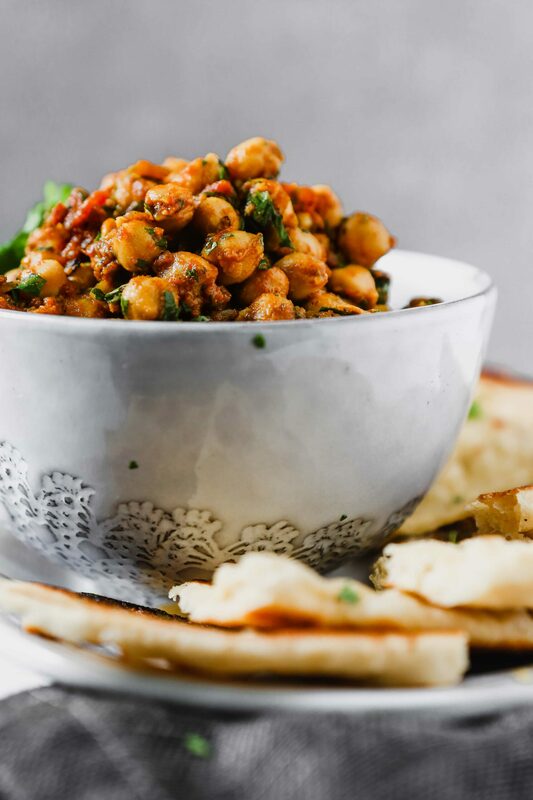 Chana Masala is spicy, but not too spicy, oh-so savory, and packed with so much flavor. How is this recipe quicker? To streamline the process a bit I’m skipping the step of making a paste and just adding the vegetables right to the pan. And using Garam Masala, an Indian spice blend, is a great way to flavor this dish without having to buy 10 different spices. Throughout the recipe I deglaze the pan with bone broth, both because it’s functional and a great way to add flavor with minimal effort. And since this dish is all about packing as much flavor in as possible, I’ve made it with Pacific Chicken Bone Broth. Can you use regular chicken broth? Sure, but there are so many great reasons to use bone broth. First off, and most obviously, it adds a ton of flavor! But beyond that, it also adds a good amount of protein, 9 grams in just 1 cup. 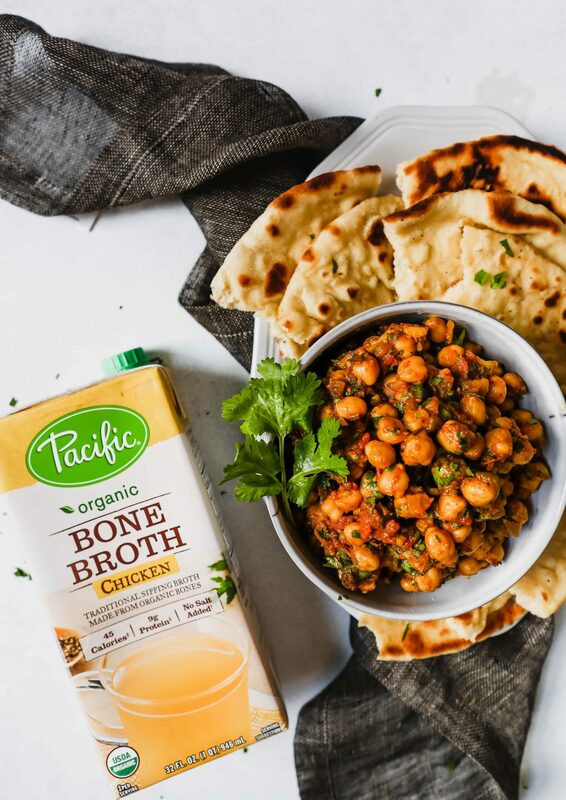 I love using Pacific Bone Broth because they value and prioritize quality and wholesome ingredients like ZK does. Their bone broth is always made with chicken or turkey bones, onions, apple cider vinegar, and spices—simple and back to the basics, which is what I like! 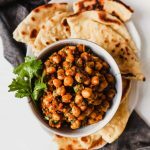 I love to serve chana masala with my homemade naan bread (purchased will do) or basmati rice—both are great for counterbalancing the bold flavors of the Chana Masala. Heat oil in a sauté pan over medium-high. Add onions and cook until translucent and golden brown, 5 minutes. Deglaze pan with ¼ cup bone broth and cook until completely evaporated, about 1–1 ½ minutes. Add serrano, ginger, garlic, garam masala, and turmeric; cook 1 minute. Deglaze pan with ¼ cup broth and cook 1 minute. Stir in remaining ½ cup bone broth, diced tomatoes, and chickpeas. Bring mixture to a simmer, then reduce heat to medium-low and simmer, partially covered, until chickpeas have softened and liquid has thickened, 15–20 minutes. Off heat, stir in cilantro and lime juice; season chana masala with salt and black pepper to taste. Serve with homemade naan (or purchased), or cooked basmati rice. To make this recipe vegetarian, use vegetable broth. This post is sponsored by Pacific Foods. All text and opinions are 100% my own. Thank you for continuing to support the brands that help make ZK possible! Totally agree—any dinner that can come together quickly from the pantry on a weeknight is a win! Isn’t bone broth such a great staple to have on hand!? The added protein is perfect for plant-based dishes like this! update: I made this on a super cold Minnesota night and it was so warming and delicious. Yay! I am so glad you enjoyed it, perfect for chilly weather! OMG just made this last night—so easy and so tasty! The bone broth really makes it! I’m so glad you liked it—isn’t bone broth such a great addition?! Thanks for stopping by ZK! I hope you enjoy! It’s become a new favorite around here!